PHUKET: An elephant camp in Phuket stands accused of refusing to return a female elephant that the Phuket Provincial Livestock Office (PPLO) confirmed today (Mar 24) belongs to another person. Livestock officers checked the microchip of an elephant at the Amazing Bukit Elephant Camp on Chao Fa 69 Rd in Chalong and confirmed that the elephant is indeed called Yo and from Surin Province – not called Nampetch as claimed by the elephant camp. The officers confirmed that the microchip matches the registration documents for an elephant stolen from Krabi province, east of Phuket, in 2003. Surajit Witchuwan of the Phuket Provincial Livestock Office told The Phuket News today, “We checked the microchip in the elephant and found it is for the elephant called Yo. “In addition, a description of marks on Yo’s legs are the same as on this elephant at the Amazing Bukit Elephant Camp. “Our part of the job is now done, it is now down to the police to resolve this matter,” he said. However, the owner of the elephant camp has refused to return the elephant to its rightful owner, Chorp Reangngern, 58, whose relatives have now taken the matter to the Damrongdharma Centre (Ombudsman’s office) at Phuket Provincial Hall. Cdr Surasak Inphrom of the Royal Thai Navy Third Area Command in Phang Nga together with fellow Navy officers and Mr Chorp’s brother yesterday (Mar 24) filed a complaint at Chalong Police Station. The complaint stated that “Nampetch” was actually Yo, who was stolen from Krabi 14 years ago. In filing that complaint, Yo’s mahout, Somsak Reangngern, 35, who is Mr Chorps’ younger brother, said, “Yo was registered in Surin province in July 2001, shortly after I took Yo to work in Phuket and Phang Nga. “In 2003 Yo and myself were working in Krabi and Yo was pregnant. One day after finishing work I tied the elephant in the forest near the elephant camp, when I returned in the morning Yo was gone. 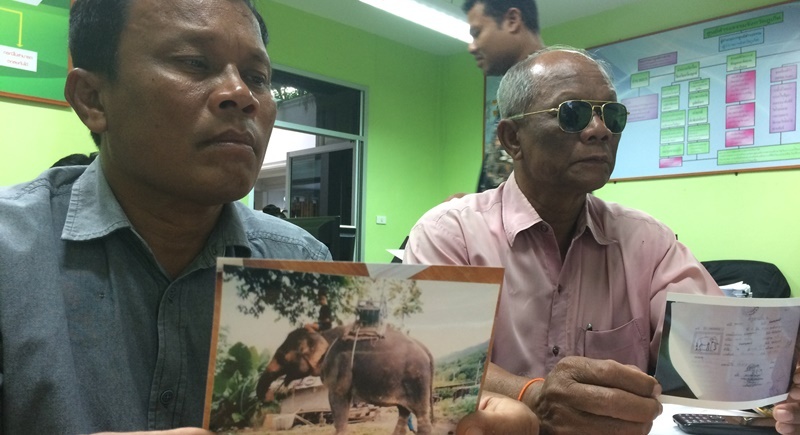 Today (Mar 24), Mr Somsak and his older brother Wan Reanggern,70, filed a complaint at the Damrongdharma Centre after the owner of the Amazing Bukit Elephant Camp allegedly refused to return Yo – despite the fact that the PPLO had proved the camp had no legal claim to the elephant. Mr Somsak said, “Phuket Provincial Livestock Office has checked the microchip – numbered 121675455 – and it confirms that the elephant is Yo. “The registration documents held by Amazing Bukit Elephant Camp are for an elephant named Nampetch and the number for the microchip for this elephant is different to Yo – 121675544,” he said. “The owner of the Amazing Bukit Elephant Camp said that he bought Nampetch for B1.4 million from its previous owner, so he doesn’t want to give it back,” he added. I think the poor elephant loses either way. Heartless elephant beaters in Surin, or heartless elephant beaters in Phuket...they're all heartless elephant beaters.